Kyle Andrews of Oceanside, CA defeated Greg Adler, Oak Park CA, 223-181, to win the handicap singles division of the 2012 JBT Las Vegas Main Event, hosted by Texas Star Lanes. Mia Singletary opened the handicap division finals with a big 239 game that eliminated Tessa Dempsey (201) and Nick Pollak (169). In simultaneous round one action, Donovin Lusher, the tenth and final qualifier, fired a big 250 to defeat Leah Zweig (188) and Katrina Andersen (176). In round two, #4 Blake Kalaf stopped Singletary 242-207, while #3 Adler beat Lusher 224-207. In the semifinals, top seed Andrews beat Kalaf 215-181, while Adler upset #2 Rance Dvorak 229-209 to set up the title match. Both Californians looked to be tough in the finals, and Adler has previously proved his prowess in JBT majors by capturing the 2012 Desert Open, but this time Greg struggled on the title pair, and Andrews just kept on striking. 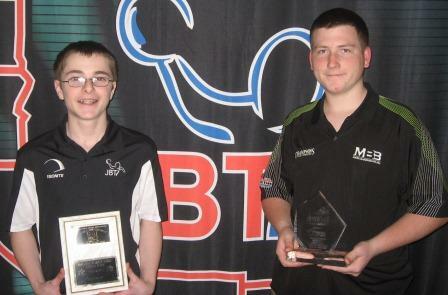 In the end Kyle cruised to the easy win, first JBT major title, and the $1,500 top prize. Big thanks to GM Jerry Francomano and the staff at Texas Station for a terrific job hosting us, title sponsor Ebonite International for their support of Main Event and JBT, and most importantly all the bowlers and parents for coming to the event. We look forward to seeing you next December for the 2013 Main Event!